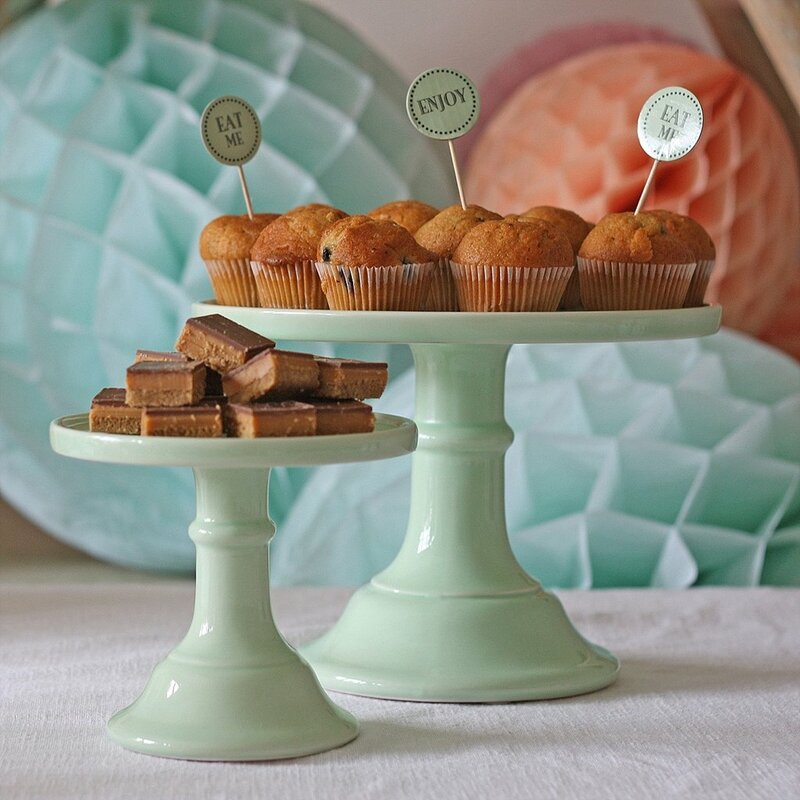 These cute mint green cake plates can be used to display your wedding cake, cookies or lots of other tasty treats. Not only will they add a pop of colour to your cake table, they will tie in perfectly with a pretty pastel colour palette. 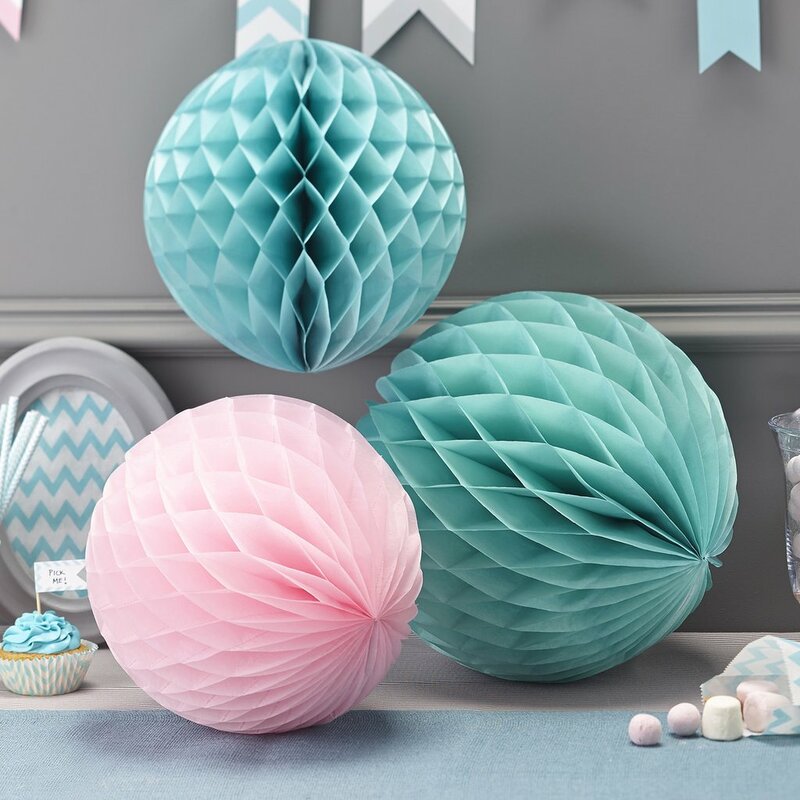 Transform your wedding venue with our pretty blush pink and mint green paper pom poms. You can hang them above or behind your wedding cake table to create a backdrop – your guests won’t be able to resist a slice of cake. 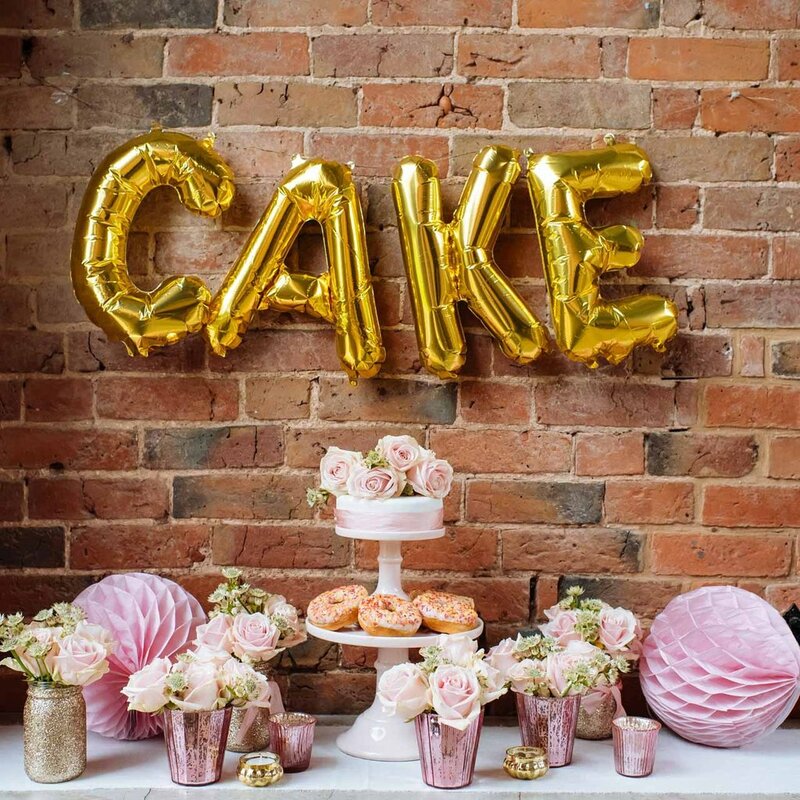 Our stylish gold CAKE balloons are a must-have for your wedding cake table. 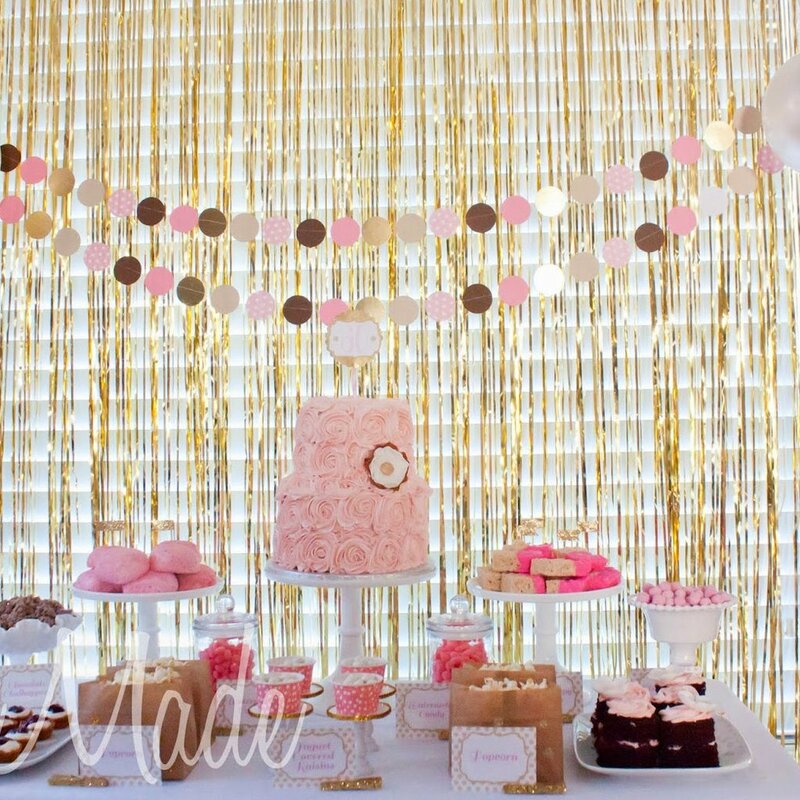 The gold foil balloons are the perfect backdrop for your dessert table, especially if you’re planning a glitzy and glamorous wedding theme. 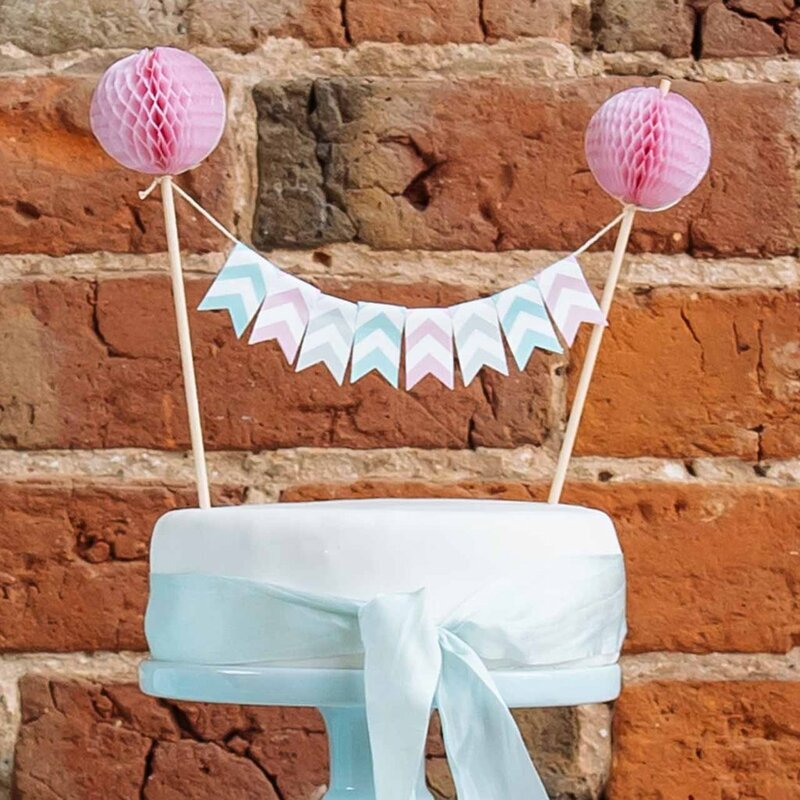 If you want a wedding cake topper that’s fun, fabulous and bursting with colour, look no further than our pastel flag bunting. Featuring a soft grey, mint green and blush pink colour palette, the cake topper is the perfect match for a pastel or country garden wedding theme. 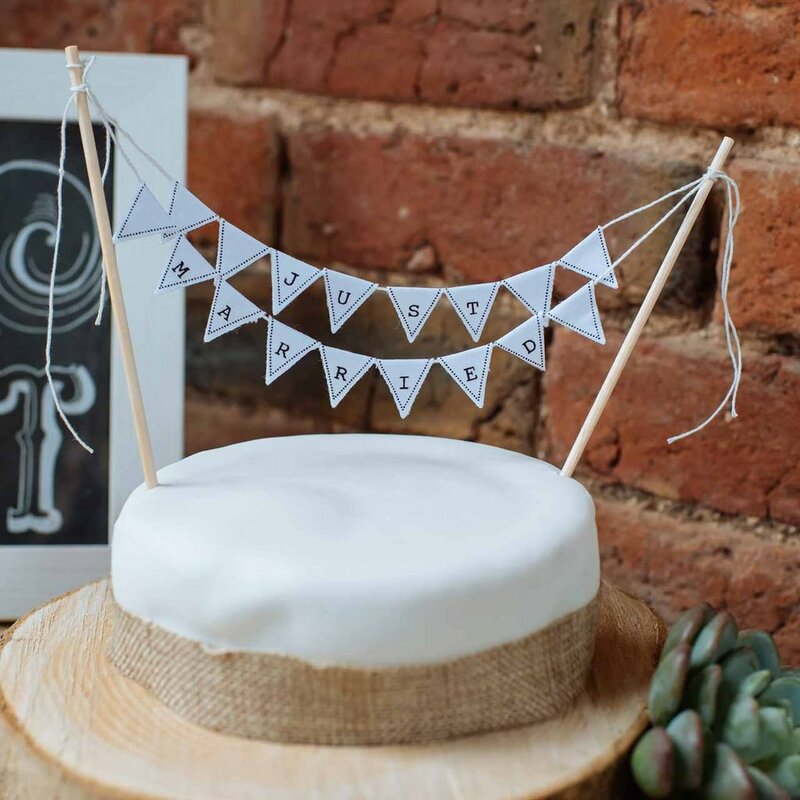 Our ‘Just Married’ bunting will add a fabulous finishing touch to your wedding cake! The simple yet stylish design will suit any theme or colour scheme, and it also suits any style of wedding cake. What’s not to love?! 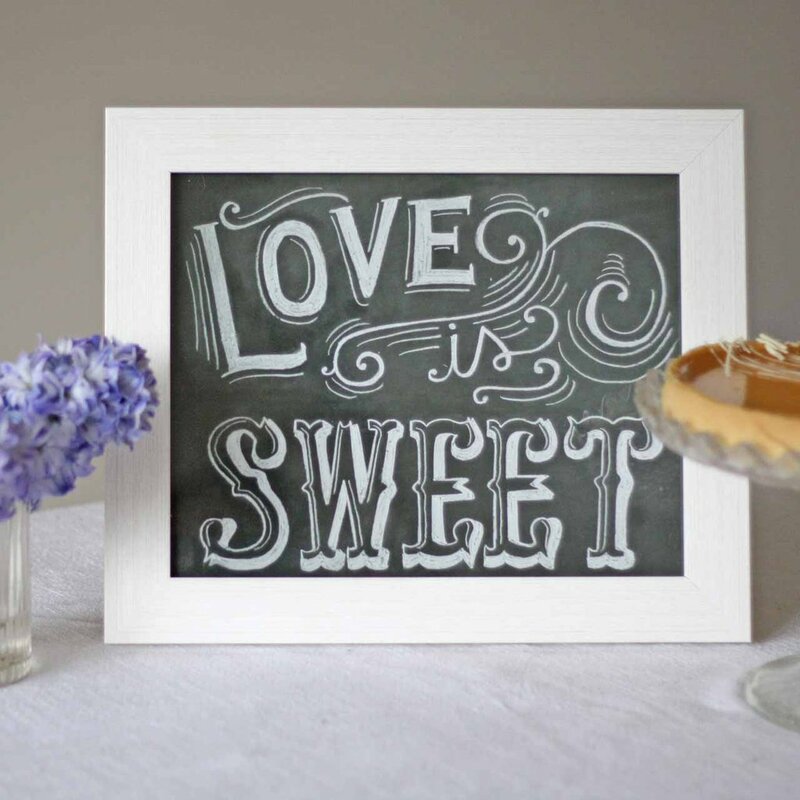 Show your wedding guests to your dessert or cake table with our ‘Love is Sweet’ sign. This is a wonderful addition to your wedding day, especially if you’re having a self-serve sweetie station for your guests to indulge in. Tree slices can be used in so many ways throughout your wedding day – from centrepieces to venue decorations! Have you ever considered using a tree slices as a rustic wedding cake stand? We love the idea of personalising your tree slices by carving your initials or wedding date into the wood. 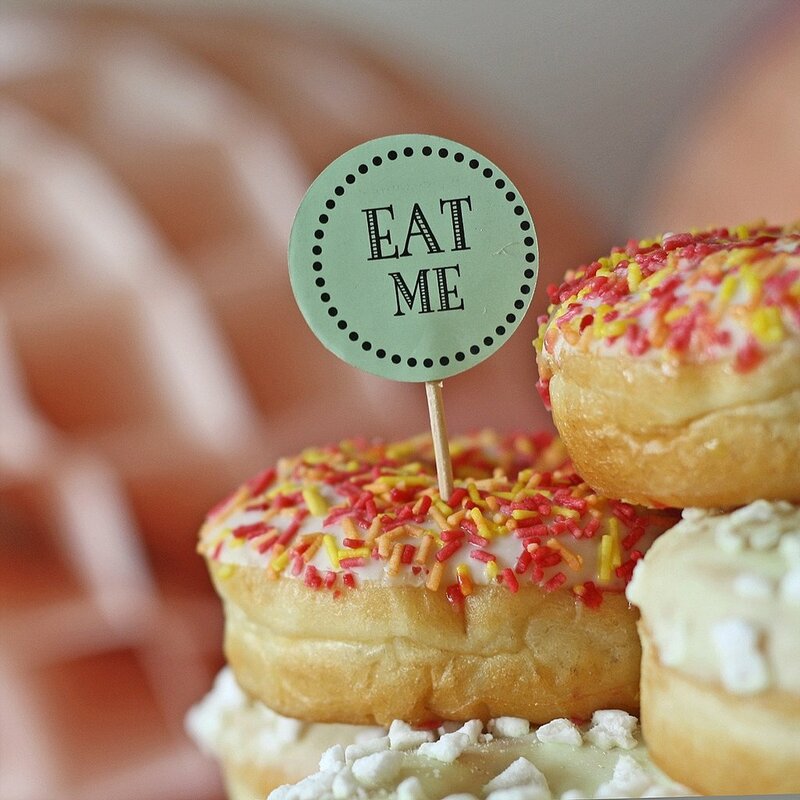 If you’re having a sweetie or dessert table at your wedding day, you’ll love our cute ‘Eat Me’ flags! You could stick them in marshmallows, cupcakes or even doughnuts – the choice is yours. They are a super sweet touch to your wedding cake table. Give your wedding cake table the ‘WOW’ factor with our glittering gold curtain backdrop. It can transform even the simplest of wedding venues and it’s guaranteed to impress your wedding guests. 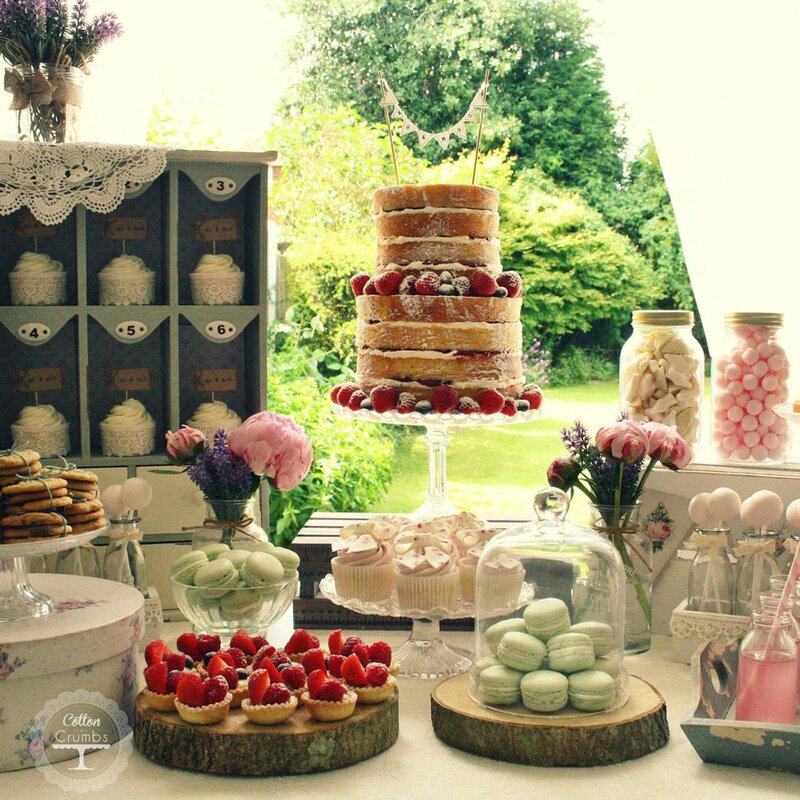 Team with lots of delicious delights stacked high on golden or blush pink cake stands. Yummy! Add a warm glow to your wedding cake table with our hanging gold birdcage. You can hang it above your table, or place amongst your cake stand and any tasty treats your are displaying. 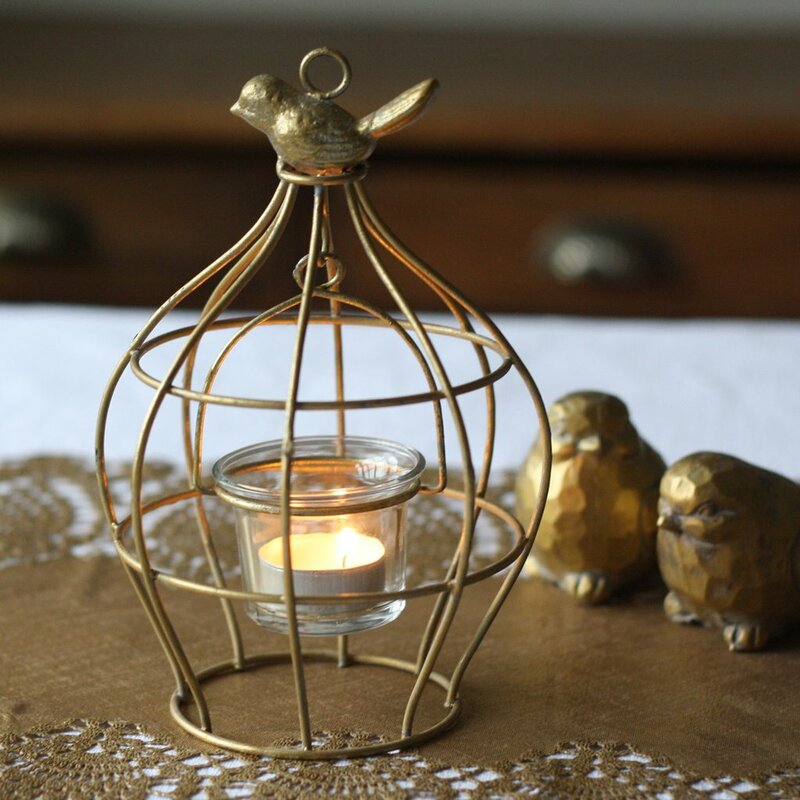 Our gold birdcages are the perfect combination of country garden elegance and rustic glamour. They can also be used throughout your wedding venue or as part of your table centrepieces. As you can see, there are lots of wonderful wedding cake table decorations to add a special touch to your big day. 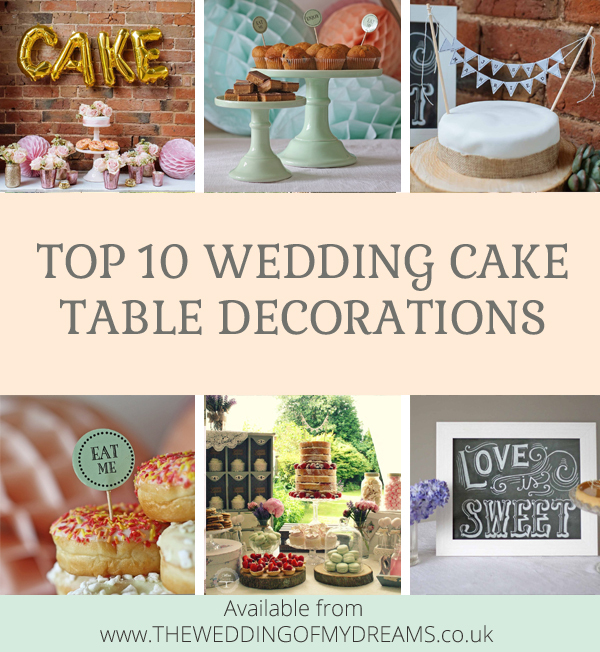 Browse our full collection of wedding cake table decorations here!